The first profoundly deaf person to sail around the world, Paul Hebblethwaite, a joiner from Helperby, North Yorkshire, took part in the BT Global Challenge 1996-97, onboard the Time & Tide. Although the crew came 14th out of 14 in all legs except the second (Rio de Janeiro - Wellington, 10th) and fourth (Sydney-Cape Town, 10th), placings do not matter. Given the disabilities on board (cerebral palsy, hearing and sight impairments, polio, chronic asthma, amputation etc. 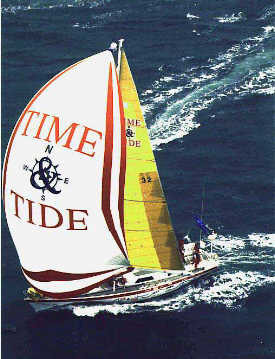 ), it is a triumph that the Time & Tide completed the race; and only a few days behind other entrants. During the voyage a cascade of frigid sea swept Paul Hebblethwaite from the bow and along the deck until his groin became impaled on a deck cleat, requiring the saloon to be turned into an operating table for emergency surgery. . But, after only a week's recovery, he was back on his feet. The story of the Time & Tide is told with passion and insight by journalist Marina Cantacuzino in her uncompromising book On Equal Terms (Simon & Schuster, London, 1997).